Northern Illinois Food Bank leads the northern Illinois community in solving hunger by providing nutritious meals to those in need through innovative programs and partnerships. Since 1983, food manufacturers, local groceries, corporations, foundations, and individuals have come together to donate food and funds, and evaluate and repack food for distribution to 800 network partners serving more than 60,000 hungry neighbors each week across 13 counties. That commitment provided 42 million meals last year to those in need. The food bank has centers in Geneva (West Suburban Center), Lake County (North Suburban Center) and Loves Park (Northwest Center) and has an office in Joliet. 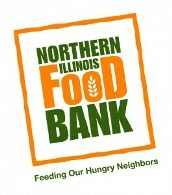 Northern Illinois Food Bank serves the following counties: Boone, DuPage, DeKalb, Grundy, Kane, Kankakee, Kendall, Lake, McHenry, Ogle, Stephenson, Will and Winnebago. Our vision is for no one to be hungry in northern Illinois. Our mission is to lead the northern Illinois community in solving hunger by providing nutritious meals to those in need through innovative programs and partnerships.